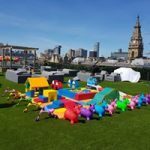 Deluxe soft play is now available and it’s a great addition to your event. Only £150 daytime hire. Immaculately clean and well looked after. Only the best for our customers.